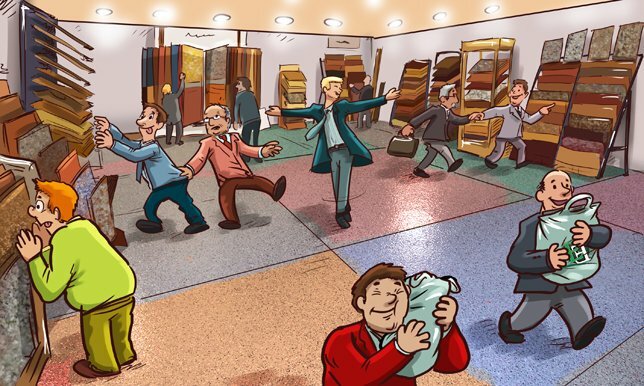 They only have one task of shopping around for new epoxy flooring for their businesses. But none of the people pictured here had any idea what they were getting into. Then they decided to check out what Everlast Epoxy Flooring has to offer. Some of them weren’t even sure what type of floor they were looking for. Others, who’d already been all over the city, refused to get their hope s up again. Instead they tried convincing themselves that they’d have no success at finding the right flooring either. All they found at the other flooring stores and big boss stores was that paint is some kind of epoxy flooring. Disappointment, you see, had sunk deep into their bones. They were tired of browsing through floor selections that simply could not provide the durability and aesthetic qualities they sought. A few even bemoaned the cruelty of their fate. They weren’t interior designers. They had no interest in samples and swatches, or in finding a floor in precisely the right shade of ash gray. Those people were carting around long mental lists of things they’d rather be doing; like playing golf, sitting back and taking a nice nap, or watching paint dry. We know, we know – it’s hard to believe that there are people out there who are passionless over epoxy floors. Upon seeing our wide collection of colors and learning about our almost limitless design options; each and every one of the people who came by found themselves imbued with the power and drive to piece together the final parts of a design scheme. It was not only functional, but representative of their personality and taste, and the look of their businesses.